That's the code for the latest Thermomix machine. What is this machine and why are people raving about it? This appliance is heralded as the new dimension in the kitchen. 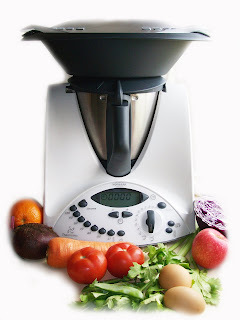 At the demo today, the consultant claimed the Thermomix can chop, beat, mix, whip, grind, knead, mince, grate, juice, blend, heat, stir, steam and weigh food. It has earned the title of the world's smallest and smartest kitchen. Amazing isn't it, that this one appliance could make all the above. There was also minimal time spent on washing in between. Thermomix is almost self- cleaning - you had to fill the water above the blades and hit the buttons and off it goes. What's my verdict? Will I buy one for kitchen? If I do, what will I do with the other appliances like ice-cream maker, Magimix processor, blender, bread maker and Kitchen Aid mixer. I believe if you're just starting to set up your kitchen, then it's wonderful to have just one appliance which can do all the above. But if you've accumulated several appliances like me, it's a little harder to cross the line. I am still thinking about making a purchase. I have been reading the various forums, blogs and recipes online. The Thermomix company has made it tempting by offering a 12 month interest free (subject to approval) for purchases in November and December 2011. It will be a great gift for someone. I think I am going to go ahead buying this, with installments. I have not seen the demo but Su convinced me with all her cooking/baking with her toy.. I have a kitchen aid too, and it is also a powerful machine, but to make ice cream and some other fancy stuff, one needs to buy add on, which is not cheap too... thermomomix is all in one, no add on required. How about selling your kitchenaid via ebay? Two attractive festures - easy fuss free cleaning and a versatile machine! Patiently waiting for my demo. My only apprehension is its size!! Now way can it feed my family of pigs!! sounds good. but how much is it? Tania: It costs A$1939 here, not sure what's the price in USA.